From Reflections of a Newsosaur:An amazing number of smart and sophisticated people continue to harbor the fantasy that philanthropic contributions can take over funding journalism from the media companies that traditionally have supported the press. In the interests of moving discussions about the endangered outlook for professional journalism back into the realm of realistic thinking, we’re going to do the simple maths today to prove conclusively why this never will happen. 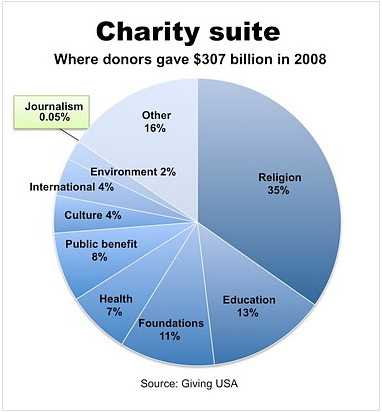 The maths, as detailed below, shows that it would take $88 billion – or nearly a third of all the $307.7 billion donated to charity in 2008 – to fund the reporting still being done at America’s seriously straitened newspapers.